Drawing arm muscles in action pose. 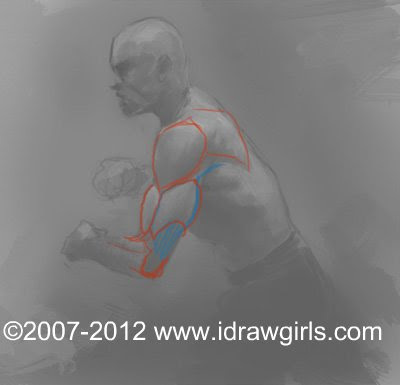 Learn to draw arm muscle, bicep tricep and shoulder anatomy muscular figther type man step by step and video tutorial. 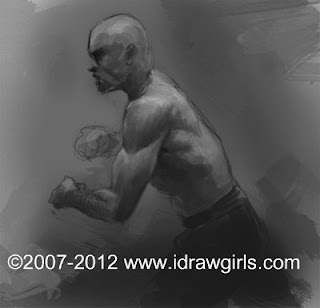 The following tutorial is part of male muscle anatomy study. I am studying the sketch, draw and render from the side view of muscular arm character design study that can be use for comics, manga, anime and video game concept art. Learn how to draw simplify arm muscle structure and upper body using simple shapes and render. There is also a few more basic tutorial that involve in drawing arm and body (torso) if this is too fast drawing here: how to draw man upper body basic, Drawing muscle body basic -torso 3/4view with shoulder and arm Male (man) and Female (woman) upper body **How to crrectly draw arm and torso together. Also Facial structure tutorial: How to draw person head basic and Draw and render human head with different light sources. More advance ? go to Character Design Face Male Merchant Character, or Drawing Male Face Swordman and Learn how to draw and paint face. They might suit your need more. I really hope to be able to simplify and make such realistic artwork bro! I am a Computer Arts/Digital Art student and I really need some help with my drawing skills! Always when I am drawing I seem to have a certain problem - I don't know what the problem is exactly so maybe you guys can help me identify it? The picture drawn below, the one on the right is mines! (obviously!) I KNOW the proportions are wrong, but for this exercise this wasn't my concern. When I'm drawing on paper my drawings look very flat, there's no depth to my lines, as you can see on the left hand one there's a sense of depth and variation. Even with digital sketching or painting, it's getting this mixture...else everything looks really flat! neovirtu> Thanks for the long considered post. :) Ah-um...OK First of, your drawing is not so bad. My question is...if this is your first try on that copy then you can't expect it to be the same level or exceed it. Unless you've been drawing seriously for over 10-20 years. It's ok it is a good practice. Before values come, you have to have a correct drawing or placement or proportion. Correct drawing and accuracy is really important...focus on that. Then comes values...simplify is the key. Decide how dark it is going to be in the certain area and maintain value consistency within the block (that's why it's called blocking in). Decide how many values you will have (3-5 should be good enough) and don't go from 0-10 value range to begin with (it makes the image looks weaker compare to the image that has the majority of 3 values, save the lightest light for small punch area). Then if you want variation in values you can make that by creating soft edge. It IS the unsatisfaction in our works that keep us going. I am never really happy with most of the work I did cuz I always thought it could have been better. Keep practicing a few hours at least everyday, then...a few months from now compare the old to the fresh new work, you will see a great result. ASK LUCAs His work six months ago and now, is like a totally different person. neovirtu> Well you must know that depth on paper is only an illusion. To give depth to something there must be at least two different values. If you happen to draw the outline of a circle the circle is only flat... lifeless But when you settle a light source and make dark against light values, then the circle becomes a sphere. I have seen that apart from the proportions and head anatomy, the drawing looks flat mainly because there are a lot of dark areas. Notice for instance, the neck of the left one... the strokes go apart from each other that will lower the value. Another big thing that is wrong in terms of value, is the shadow casted by the nose. Your shadow value is the same as the hair value, whereas on the left one, the shadow behind the nose is much lighter than the hair... and so on and so forth. I hope you got what I mean... As Xia (owner of this blog) keeps on telling us, value is VERY important. You are right about un-satisfaction, that is the drive! Luca's work has improved alot as I can see...a very good example. Also, Xia, I followed most of your animal tutorials, I will scan in the pictures soon. Very helpful! neovirtu> Don't press too hard on the pencil, it will make your hand tired quicker than it should be. Keep it loose and light, but keep control of where it goes. Within the block...try to keep the consistency of the value...variant it when cross over to other value (edge). Keep it simple. I usually use Graphite pencil or stick 2b to 4b. Experiment with many ways you can hold and do the shading the way you like. Angle, whole block, experiment with all different medium and see which suit you best, we all like different things. Work on the picture as a whole and break it into simple shapes, like a spheres and cylinders. The line placement i crucial to make the illusion of depth. Hold you tool loosely and sketch big. Here's some video tutorials from the net. They might help you. I think I should block in three values and stick to those only...but it's hard - because I put emotion into drawing, not so much technical feeling...but more emotional so I can get carried away. When I do draw loose and light, the drawing looks very good but much messier...but still good! Pokepetter: Thank you so much for your video, it is very technical and I like the theory behind it, I've watched a few more and I will be keeping an eye on you.. I never used to have intent when I was drawing, now I do. I used to just let my hand go free, not my mind - it can be a hit and miss...but I feel there's a good technique in start the line and ending it and then shaping it. Thanks once again, I appreciete your input! you're not bad. keep on drawing. You still need to practice accuracy and such. Also, portraiture is probably not the best place to start. If you get it just a little bit wrong, it'll look off. The face is very complex in terms of topology and therefore the correct placement of value can be difficult and time consuming. Make sure you can define the primitives(spheres,cubes, ect. with values. Experiment. Remember that form is defined through light and lack of light(shadow). Imagine a light source and imagine how it affects the object and where shadows fall. I also want to clarify that the tutorials are not made by me, but someone else. I just happened to find 'em.